This last week marked the third anniversary of Shelf Love’s first post! Since Teresa and I are currently having a wonderful time together here in the Pacific Northwest, catching up (and talking about books nonstop), we decided to celebrate the anniversary by giving away some of our favorite books to some of our favorite people: our readers. Jonathan Strange and Mr. Norrell, by Susanna Clarke, a novel about the workings of magic in an alternate 19th-century Britain. The Beekeeper’s Apprentice, the first in the Mary Russell/Sherlock Holmes series of mysteries by Laurie R. King. The Mill on the Floss, George Eliot’s masterpiece focusing on the intelligent and independent Maggie Tulliver and family. If you’d like to celebrate this momentous event with us by winning one of these books, please leave us a comment telling us which one (or more) of the books you’d like to have. If you’d like, also let us know: if you were giving away three books you love and wish more people would read, which ones would you choose? We will have three drawings, one for each of the books (one winner per book) and will announce the winners on Friday, April 22. We will ship worldwide, so if you live outside the United States, don’t hesitate! We look forward to hearing from you all this week, and to continuing to read and write in your company! We know you’ll enjoy them! I’ll be emailing you for postal addresses and you’ll be seeing these books soon. Thanks to everyone for all the charming anniversary wishes, and for the delightful visions of the books you’d give away! This entry was posted in Giveaways, Sunday Salon. Bookmark the permalink. 40 Responses to Sunday Salon: Blog Anniversary! Oh I would love to have The Beekeepers Apprentice! What a wonderful series that is. I would love to win either Jonathon Strange and Dr. Norrell or The Beekeeper’s Apprentice. Both are books that I’ve heard a lot about but haven’t got around to reading. Oh, count me out—I don’t want to enter, but I do want to celebrate your anniversary! Congratulations, ladies! The other question is tough; I’m not sure how I’d choose! 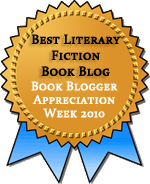 I’m not interested in one of the books but wanted to say Happy Blogiversary! any of the books would be great,Anna Karenina,the new translation alice Munro short stories both a joy to give. Wonderful – congratulations, many more, etc. I would give away The Entail by John Galt, the Selected Poems of Victor Hugo, and Death’s Jest-Book by Thomas Lovell-Beddoes, although that last only to carefully chosen recipients. No giveaway books for me, though, thanks. Of course I could easily come up with lots more!! I love your giveaway idea and I hope you don’t mind if I borrow it for my blogoversary. Oh — and I’d loved to be entered into the drawing for The Mill on the Floss. I loved Middlemarch and I’m about to read Daniel Deronda, so I’d love to complete the set! Thanks again for the generous giveaway! I am going to refrain from entering because I actually own all three of the books that you’re offering (though I’ve only read the Mary Russell!). Great choices, though, and I know that the three winners will be all the richer for them! Oh, how lovely that you’re together for your anniversary. Happy blogiversary! No need to enter me in the giveaway — I’m starting to panic a little bit about how many books I have, and how little space — but if I were going to do a giveaway of three books everyone should read, they would be (maybe, I’m sure this would vary from day to day) Fire and Hemlock, The Secret History, and Blankets. Congrats! I would love The Beekeeper’s Apprentice or The mill on the floss. Congratulations on your anniversary – and on your excellent blog! I’d choose The Mill on the Floss – first because I’ve never read any of George Eliot’s books (though Middlemarch is on the TBR pile), and second because I recently read an essay about Eliot, which said that Eliot is a better writer than Jane Austen. Now I’m intrigued to read Eliot. As for books I wish were better known: A Time of Gifts, by Patrick Leigh Fermor; Miss Marjoribanks, by Margaret Oliphant; and Anybody Can Do Anything, by Betty MacDonald (or The Egg & I, or The Plague & I). Congratulations! (3) years for me in June. I have all (3) of these books on my shelves (unread) and have been meaning to get to them. I have all three of these on my “must read” list, so I’d like to enter for all three! Happy Blogoversary! I’ve read your three favorites, and own them, so don’t enter me. The one book I always recommend and try to give away, even to my most well-read friends, is Nick Harkaway’s The Gone-Away World. So far no one has disliked it, although one may not have succeeded in reading it yet, and that’s a bit of a black mark, I know. It took me 70 pages to get interested in it the first time. Congrats on the anniversary! I’m very glad you two are blogging! I already have the books in the give-away, so I’ll bow out of it this time. But thanks, though! Happy blog anniversary you two! Your blog is wonderful :) I’d love Mill on the Floss, I really need to start reading Eliot! 3 books everyone should read… Ronia, Robber’s Daughter (Astrid Lindgren), The Ladies’ Paradise (Émile Zola) and A Prayer for the Dying (Stewart O’Nan). Ooh, I’d like to try the Beekeeper’s Apprentice. 1) Last Chance to See by Douglas Adams (nonfiction but still). I guess I’m in a Western mood today. Happy anniversary! I would love the Beekeeper’s Apprentice! I would give away Anne Bronte’s The Tenant of Wildfell Hall, because it is marvellous and not enough people know about it; Stieg Larsson’s The Girl with the Dragon Tattoo, because it is so riveting and thrilling; and Maggie O’Farrell’s The Hand That First Held Mine, because you get to know London so wonderfully through it. Happy blog anniversary. I would love to win Dr Strange… or the Beekeeper’s Apprentice. Happy Anniversary – I love Aunties (so sad they had to compress their selections (I loved walking up to the third floor when it housed their used books). Perhaps we could meet for coffee sometime? Yes, I’d love to! I didn’t know we had any readers in Spokane — I’m thrilled! I would love to win Jonathan Strange and Mr. Norrell. It’s one of those books I’ve always wanted to read but just never gotten to. Would love to have The Beekeeper’s Apprentice! I’d love to have The Beekeeper’s Apprentice because Sherlock Holmes is one of my all-time favorite characters! Not entering because I have those books already (!) but I just wanted to join in the anniversary celebrations. Love your blog! Hey Jenny! Hey Teresa! Just wanted to introduce myself and say happy blogoversary! I’ve been a silent reader of your guys’ blog for a while and, as I’m finally setting out to get myself seriously involved with the book blogging world, have come to regard you guys as role models in the sense. I’m not specifically interested in winning any of the books (they should probably go to your more devoted and long standing readers) but just wanted to say hello and thanks for always having such amazing reviews! Happy Anniversary!!! I love your blog and would love to win Jonathan Strange and Mr. Norrell. Mainly ’cause I’m a sucker for all things magic and I love the cover art :). Happy three years! No need to put me in a drawing. Just glad your blog is still going strong and hope it continues to do so! I would love to win The Beekeepers Apprentice!! Thanks for the chance to win! I would love to win “The Beekeeper’s Apprentice”! If I were giving away three books, I’d choose three copies of “The Sparrow” by Mary Doria Russell, because you can never have too many people reading that book. It’s fantastic. Congratulations! I’ve read and loved both Jonathan Strange & Mr. Norrell and The Bee-Keeper’s Apprentice but am embarrassed to say I haven’t tried any of George Eliott’s novels! My three novels I’d choose to give away would be: The Secret History by Donna Tartt, The Night Watch by Sarah Waters and The City & The City by China Mieville. Happy Blogversary to both of you – well done! Please enter me for the Beekeeper’s Apprentice – thanks. My 3 novels would be: Riders of the Purple Sage by Zane Grey; All Quiet on the Orient Express by Magnus Mills; and The Juggler by Sebastian Beaumont – a contemporary UK mind-messing novel!